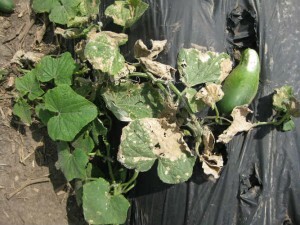 Cucurbit downy mildew is an important foliar disease that affects all types of cucurbits. 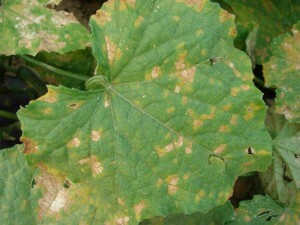 This disease is caused by the fungus-like pathogen Pseudoperonospora cubensis. 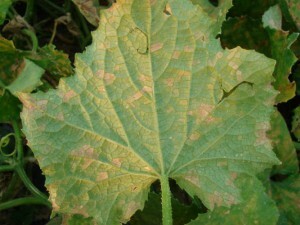 Cucurbit downy mildew spreads rapidly and can cause extensive yield loss. 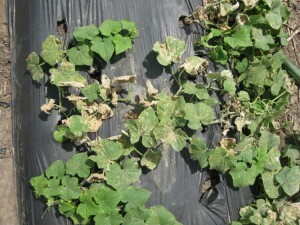 Management of cucurbit downy mildew relies on cultural practices to reduce moisture on leaves and fungicide applications based on a disease forecasting and monitoring system. 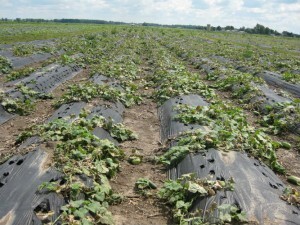 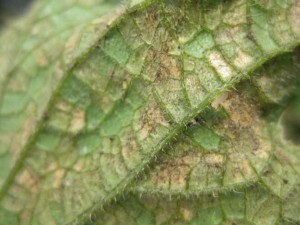 Pictures of lesions caused by downy mildew on the top (top left) and underside (top middle) of cucumber leaves; sporulation of the pathogen (top right); and infected cucumber fields (bottom row).